This past February I went to see the hit Off-Broadway musical Fiddler on the Roof in Yiddish. The night I went, I was expecting to see Drew Seigla in the role of Perchik, but instead, I was introduced to Michael Einav who was playing the role that particular evening because Drew was out. Michael was incredible in the show. He didn’t miss a beat! I was so amazed by Michael’s performance, I knew I had to interview him. Fiddler on the Roof in Yiddish is currently playing at Stage 42 in NYC (422 West 42nd Street, between 9th & 10th Avenue). Click here for tickets and follow the show at http://fiddlernyc.com, Facebook, Twitter, and Instagram! 2. You are currently in the hit Off-Broadway run of Fiddler on the Roof in Yiddish. The night I saw Fiddler, you were on for Drew Seigla, in the role of Perchik. 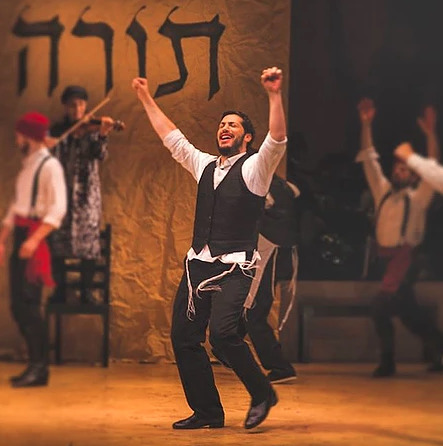 My first question is, what is it like to be the understudy in this show, especially with the added layer of the show being performed in Yiddish? Being an understudy is very challenging, especially in Yiddish, a language I don’t speak. I grew up hearing some Yiddish from my grandparents, but other than a few words here and there, I don’t speak it. I’m on stage every night doing my regular ensemble track, and every now and then I go on as Pertchik, Motl, or the Rabbi. I’m not going to lie, it’s not easy...But by now I’ve gotten used to drilling lines almost every day so I can be ready to go on at a moment’s notice. We are very fortunate to have the most amazing, supportive cast and crew - which makes it easier, because I know they always have my back when needed. I guess the bottom line is that it’s challenging, but very rewarding! 3. How far in advance do you typically know that you will be going on as the understudy? I have some dates that I know of a couple of weeks in advance, if someone has a planned out like a wedding or something...Or, I can wake up one day and get a call from our awesome stage manager saying that I’m on in two hours because the actor I understudy is sick, which is exactly what happened the day you saw me as Pertchik. 4. Since you don't play the role every night, how often do you rehearse the role, to keep fresh on his lines? In terms of lines - to each his own... drill, drill, drill! I go over lines in the shower, on the subway, during lunch...But we also have understudy rehearsals once a week so we all can stay fresh with the blocking, which is great because on top of blocking we can make our acting choices clearer. It’s great because I feel like the audience is being respected and given the highest standard of professionalism, wether they’re seeing an original cast member or an understudy-or “wonder-study”, as we are called by the team. 5. What has your journey been like with Fiddler going from downtown to uptown? What has been the best part & what has been the most challenging? This whole experience was so amazing and also unexpected! This show was supposed to be a summer gig for eight weeks. No one predicted the great success it has become. It is such a beautiful story we get to tell, and in the language they would have spoken had Tevya and his shtetl been real people. I think the best part of this journey was working with such a wonderful group of people, led by the legendary Oscar and Tony winner, Joel Grey, who is the sweetest, most talented and caring director and human being. I moved to New York four years ago from Tel Aviv, Israel. Five years ago, everything that I’m experiencing right now seemed like science fiction. But it’s real! Most challenging? I’m exhausted - but happy. Those two things can coexist, and it’s ok! I’m grateful to be doing what I love. 6. What's your favorite scene to either be in or watch? Definitely “The Dream"! It is so funny, visually beautiful, and clever! 7. One of the songs performed in Fiddler is "Sunrise Sunset." Where is one place you'd just love to watch the sunrise or set? Tel Aviv has the most beautiful sunsets! I try to go home twice a year to visit my family and friends, and my brother has a balcony facing the Mediterranean Sea. The sunsets are breathtaking! 8. Another famous song in Fiddler is "Tradition." With the Jewish holiday of Passover coming up, what are some traditions you have kept with you from childhood? I love Jewish holidays so much. It is not a religious thing for me, it’s my heritage and...well...tradition! I celebrate all major holidays, and this year my parents are coming to New York to celebrate Passover with me (and my birthday! ), so we’re having a little Seder and I cannot wait! 9. Are there any projects you are currently working on outside of Fiddler that you can share with us? I’m working on a translation for an amazing Broadway bound Israeli musical into English, along with some great friends and creatives. Unfortunately, I cannot give any details...But if it goes well (Toi, toi, toi), it will be revolutionary! Training: GSA, U.K. Off-Broadway: Scoop, The Golden Bride. Israel: Parade, The Sound of Music, My Fair Lady, and more…TV: Israeli Idol, The Singing Bee, Our Song. Voice: Flynn Rider in the Hebrew version of Disney’s Tangled and other animated favorites.